This super vegetable salad is light, healthy, and the perfect dinner when you're on a diet--or any night! 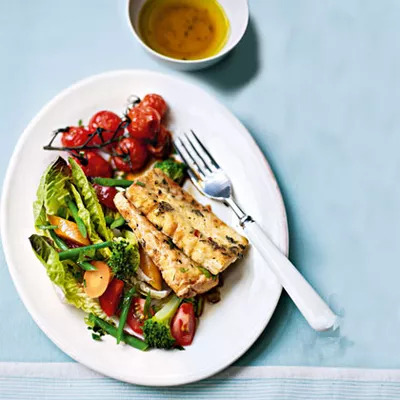 Tofu keeps the calories low and is a great source of lean protein. One serving is 267 calories with just 2 grams of saturated fat. Just roast the cherry tomatoes for 10 minutes in the oven, and steam the broccoli, beans, and carrots. The tofu is dipped in cornmeal and sauteed until golden. Combine these with all other ingredients and drizzle with the dressing. Yum! Ingredients: Tomatoes, broccoli, green beans, carrots, lettuce, scallions, extra-virgin olive oil, red wine vinegar, Dijon mustard, maple syrup, cornmeal, fresh herbs, tofu.